Even if you do a couple of hundred reps for each set of your triceps extensions, it won't help the fat on your upper arms to disappear. And you won't get rid of the fat on your hips by doing sets of hundreds of reps on the leg press either. Spot reducing fat through training is impossible, as any good trainer will tell you. But until a few years ago there was no scientific proof for what most people knew from experience. Not until Chilean scientists published the results of a small but convincing study in the Journal of Strength and Conditioning Research. But the studies weren't terribly convincing. Genuine spot reduction means that you have to measure fat in specific parts of the body and then observe that subjects only lose fat in these spots. The Chileans decided to adopt a different approach. They got 11 students to train one of their legs on a leg press machine three times a week for 12 weeks. The load was low, between 10 and30 percent of the weight at which the students could just manage 1 rep.
Each workout consisted of just one set, but it was a set of 960-1200 reps. This took the subjects about 80 minutes to complete. That should burn off quite a few calories. Before and after the training period the researchers did scans of the students to measure their bone mass, lean body mass and muscle mass. The table below shows that this training programme had little effect on the bone mass and little effect on the lean body mass of the subjects. Their total fat mass decreased by 700 g however – and that was a statistically significant effect. The amount of fat reduction on the trained leg was 20 g; the amount lost on the untrained leg was 70 g. The difference between these two was not statistically significant. The students lost most fat from their trunk. The Chileans conclude that spot reduction of fat is not possible. 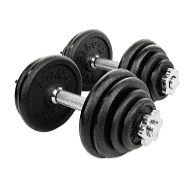 Strength training with extremely high amounts of reps is a way of losing body fat all over your body. But this form of training doesn't help build muscle mass. When children and teenagers start training with weights, without changing their diet and without combining their strength training routines with endurance or cardio training, their fat percentage drops. Men who do strength training keep their fat percentage lower in the long term than men who run, cycle or do other aerobic exercise.